Comet 011190A White Garter Spring Kit (2 Springs per Package). Comet Industries 011190 "White" Garter Springs. Home > Comet Clutches and Parts > Comet 216115A, 2-Pack of “Blue/Silver” Garter Springs. Comet 20/30 Series (Jr. Dragster). > Comet 011190A White Garter Spring Kit (2 Springs per Package). Comet 011190A White Garter Spring Kit (2 Springs per Package). Comet Industries 011190 "White" Garter Springs for Comet 20/30 Series Centrifugal Clutch System (TAV/TAV2). 3100 RPM with Zinc (Stock) 320g Weight Kit #202933A. 4000 RPM with Aluminum (Optional, Die-Cast) 146.8g Weight Kit #202931A. 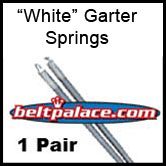 Sold as Package of TWO - 011190A WHITE Garter Spring. For use with Comet 20 Series, 30 Series, Torque-A-Verter, and TAV2 Centrifugal Clutch systems. Genuine 011190-A made in USA by Comet Industries. Comet 202931A. Aluminum weights (shoe driver assy). 146.8 grams. Springs sold separately. Comet 202931A. Die-cast Aluminum weights (shoe driver assembly). 146.8 grams. Springs sold separately. 200344A (Single-Pack) Shoe Driver Assembly. Replaces OEM Shoe Driver Assembly for 20, 30 & Torq-A-Verter belt drive Go Kart Clutches. These Comet Industries part #200344A replaces worn out or broken Shoe Driver Assemblys on Comet 20 Series, 30 Series, and TAV Go Karts including Kenbar 300-006, Comet 200344 parts. Factory Sealed Genuine Comet Part!